Another casual game done right. f you asked me two weeks ago what frogs and colored balls had in common, you'd have likely received a sideways look or perhaps an inappropriate reference to a fictitious disease. While I had never played the wildly popular original Zuma, after a short while with PopCap's highly anticipated sequel, Zuma's Revenge, I began to understand what many already knew — Zuma is a blast. the end goal.It shouldn't have surprised me; PopCap consistently releases quality games that, despite their casual stigma, are fun for all gamers. Zuma's Revenge is no exception, delivering a pick-up-and-play experience that can satisfy for both short and long sessions. For those new to the series, the concept is simple: colored balls run along a track towards an end goal. Your objective is to prevent the string of colored balls from reaching the end goal by launching your own colored balls towards the line in an effort to form chains of three, thereby causing the matched balls to explode. Along the way you can gain special abilities, such as slowing the line and reversing its direction; as well as trigger score multipliers by destroying multiple chains of balls without a miss. While this concept can be easily grasped in seconds, it will take significant practice in order to achieve some of the par times and scores. 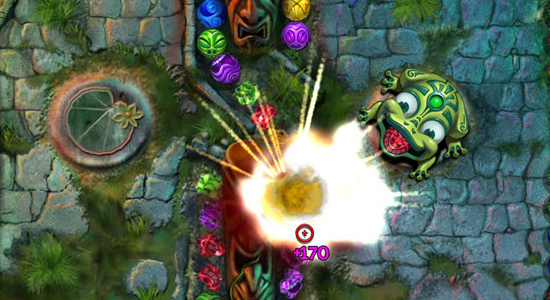 After spending some time with original Zuma, it's clear that Zuma's Revenge simply acts as an extension of the series — with more maps, abilities and game modes (such as the fabled, Iron Frog gauntlet) that players both new and old should enjoy, while retaining the core gameplay that made the original so successful. It's a smart, albeit conservative, approach to a series that needed little more than an update. that should please most.There's nothing remarkable about Zuma's Revenge from an aesthetic sense. That's not to say it's an ugly game, it actually retains a cutesy art style that should please most — just don't go benchmarking your computer. Like other PopCap games, accessibility has remained far more important that pixel-pushing, so even computers nearing half a decade old should have no trouble playing the game. Multiplayer was a notable omission from the original Zuma, and unfortunately, one that remains in Zuma's Revenge. Today, it could be argued that multiplayer functionality is required, especially for games like these where the social experience can be just as rewarding. Peggle benefited tremendously from the addition of both cooperative and competitive game modes, and it would be nice to see similar options available for Zuma down the road. If you're on the hunt for a game that can break up marathon sessions of World of Warcraft or long nights of Halo, look no further. Zuma may be just what you're after. Even if it isn't, Zuma's Revenge can stand up on its own as yet another casual game done right. Thanks, PopCap. vreau sa joc zuma's revenge e cel mai tare joc.